Career Compass Canada’s professional multi-disciplinary Talent Management Team has a range of deep experience and credentials to meet client needs. Each team member is committed to ensure service excellence and results driven with sustainability strategies. Any of our team members would be pleased to have a discovery meeting to understand challenges, offer solutions and define outcomes. BRIAN EPSTEIN - BComm, BEd. Melissa works with clients to understand and deliver on key strategic people solutions to build bottom line results by having a strong aligned and engaged team focused on goals and objectives. Melissa demonstrates consistent success in partnering with business leaders to optimize organizational effectiveness. She is an experienced professional with an extensive strategic HR background with progressive leading edge companies. Melissa is proficient in designing, implementing and managing effective policies, programs and processes. Her ability to understand the needs of the business and execute on various programs has led her to be a sought-after individual for outsourced HR solutions. She is a global leader who has worked with companies in Canada, the United States, the United Kingdom, Netherlands and Germany. Melissa has diverse human resources and management experience in the software, insurance and technology sectors. Over the span of her career she has led HR initiatives including recruitment and selection, policy design, payroll, compensation, performance management, compliance reporting, HRIS implementations, HR workflow development, training and development, benefits administration and pension plans. Melissa is a specialist in organizational change management and has worked with companies who are undergoing acquisitions and closures of business units. She has been credited with high Employee Satisfaction and career development through coaching and engagement. Melissa is President of Career Compass Canada. Nance is an accomplished career and executive coach with a focus on leadership training, team engagement and career transition. She is an accredited International Coach Federation (ICF ) executive coach and CPI Certified Career Transition Counselor. Nance is certified in the use of Strategic Leadership Development assessments offered through Management Research Group (MRG) that includes 360 assessments and Individual Directions Inventory (IDI). Nance is also a proud faculty member of Coach U – a leading global provider of coach training programs for practitioners wanting to advance their knowledge and skills as professional coaches. She has served in executive management roles with both Canadian and US owned companies. She is also considered a national leader in wellness coaching and has more than two decades of experience as an instructor/coach for personal and professional development. 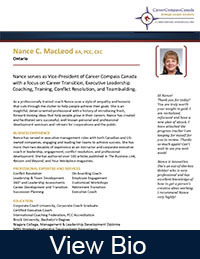 Nance serves as Immediate Past-President of the Board of Directors for the Toronto Chapter of ICF and is President of Executive Coach Global - a specialized division of Career Compass Canada. TORONTO, Jan. 30, 2018 /CNW/ - Members of the International Coach Federation – ICF – Toronto Chapter have elected a new President to lead one of North America's largest chapters. 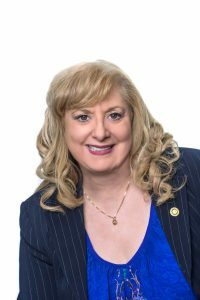 Nance MacLeod will take over the role from outgoing President, Derrick Navarro, after he finishes serving his seventh successful year on the ICF Toronto Board. MacLeod said, "I look forward to serving the 400+ professional coaches that make up our membership and continue to advance our coaching profession at all levels. A top priority will be to maintain ICF Toronto as one of the global leaders amongst all the ICF International Chapters recognized for its creativity, innovation, and engagement of its coaching community," she said. MacLeod is an ICF-accredited Professional Certified Coach (PCC) and serves as President of Executive Coach Global. 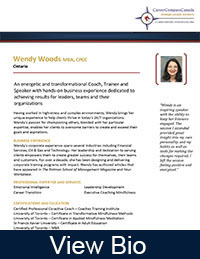 She is also part of the coach training faculty for Coach U.
ICF Toronto was founded in 1999 to promote awareness and public recognition of the value and impact of professional coaching and to cultivate a collaborative coaching community to advance the art and science of coaching. Its innovations include the creation of "The PRISM Award" – the highest award of the coaching profession which recognizes coaching initiatives in organizations that have implemented coaching effectively to inspire leadership development and organizational transformation. ICF is the voice of the global coaching profession with more than 17,000 professional and executive coaches in over 95 countries. "ICF is the gold standard for our profession," says outgoing President Navarro who is an ICF-accredited Associate Certified Coach - ACC. "Continuing to raise the bar in our profession remains a top priority," he said adding, "The use of Professional Coaching is a growing strategy that is being embraced across many industry sectors, both private and non-profit, as organizations focus on meeting the growing demands placed on their people and dealing with multi-generational workforces." ICF Toronto will host its full day coaching conference, Journey to Mastery, on March 6th, 2018 at Toronto's Beanfield Centre. Julian is a Professional Certified Coach providing Executive Coaching, Leadership Coaching, Career Coaching, and Relationship Coaching to senior leaders in both the public and private sectors. As an experienced coach, Julian helps his clients focus on what’s important to them, providing the right balance of challenge and support so they achieve their development goals. His clients appreciate his ability to understand the context within which they operate, provide feedback with sensitivity and directness, clarify their thinking, and turn thinking into action. The end result is long-term positive impact from each coaching engagement. Jane Graydon is an Executive Coach who inspires leaders to deliver unprecedented results and realize their full leadership potential. With over three decades of coaching, leadership development, and real-life, in-the-trenches business experience, she is an experienced thought partner. Jane has a unique appreciation of leading complex organizations through change. Jane focuses on building leaders’ strengths through feedback, self-discovery and accountability. Jane held executive positions in healthcare and global telecommunications. Jane also taught Leadership at Simon Fraser University and co-owned a motorcycle dealership. She studied International Business in Japan after receiving her MBA in Human Resources and her Bachelor of Commerce from McMaster University. Jane is TILT 360 certified. She is an active member of Toronto Organization Development Network, Strategic Capability Network and is a Director of International Coach Federation Toronto Chapter. Claudia is a certified professional coach both with the International Coach Federation (ICF) and the Coaches Training Institute (CTI). She is also a trained mediator and a member of ADR Institute of Ontario. 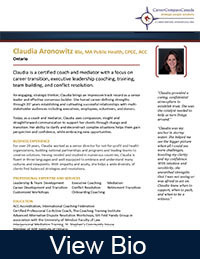 After 20 years as a leader in the not-for-profit and health sectors in different countries, Claudia became an accomplished coach and mediator. Empathetic and provocative, Claudia helps her clients find new perspectives and opportunities in times of transition. 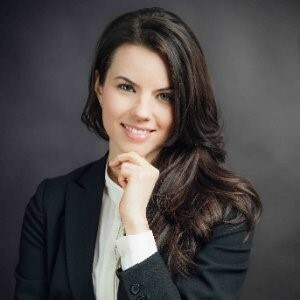 She believes that strong connections are key for individuals and organizations to thrive, and she helps her clients achieve this by creating positive communication channels and building conflict resolution skills. Areas of expertise include: career development and transition, executive coaching, leadership development, mediation and conflict coaching. 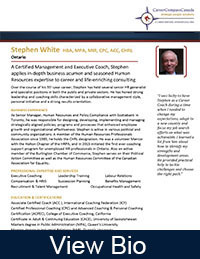 A Certified Management and Executive Coach, Stephen applies in-depth business acumen and seasoned Human Resources expertise to career and life-enriching consulting. Over the course of his 35+-year career, Stephen has held several senior HR generalist and specialist positions in both the public and private sectors. He has honed strong leadership and coaching skills characterized by a collaborative management style, personal initiative and a strong results orientation. As Senior Manager, Human Resources and Policy Compliance with Scotiabank in Toronto, he was responsible for designing, developing, implementing and managing strategically aligned policies, programs and processes that enhanced employee growth and organizational effectiveness. Stephen is active in various political and community organizations. A member of the Human Resources Professionals Association since 1985, he holds the CHRL designation. He was a volunteer Mentor with the Halton Chapter of the HRPA, and in 2015 initiated the first ever coaching support program for unemployed HR professionals in Ontario. Also an active member of the Burlington Chamber of Commerce, Stephen serves on their Political Action Committee as well as the Human Resources Committee of the Canadian Association for Equality. Brian is an experienced career coach who teaches courses on career and employment-related subjects at the college level. He has worked with clients from diverse backgrounds at all levels of corporate, government and academic organizations to help them achieve their career and leadership goals. Brian has achieved coaching certification from Coaches Training Institute. Wendy is an accomplished corporate trainer, coach and consultant specializing in Productivity, Leadership and Work Life Balance. 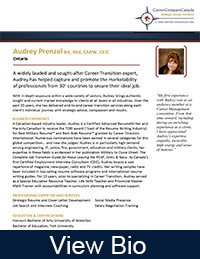 She brings over a decade of experience providing workshops, webinars and one-on-one coaching throughout North America. By focusing on Emotional Intelligence, Mindfulness and neuroscience she brings passion and purpose into the workplace. She has authored several articles including Meditating at Work: A New Approach to Managing Overload and Mindfulness @Work: Reduce Stress, Increase Focus & Improve Results that appeared in the Rotman School of Management magazine. She is also co-author of the book 365 Days of Gratitude and is a certified Professional Co-active coach and a member of ICF. 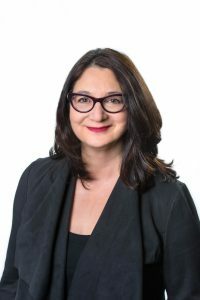 Aline has made a lifetime career in HR and has worked for major brands such as Hudson’s Bay Company, Loblaw’s and Sears Canada and founder of Aline Ayoub HR Consulting. She is an award winning coach and has been recognized by the Leadership Action Centre. Aline is fully certified to administer Myers-Briggs assessment tools and is an active member of HRPA. 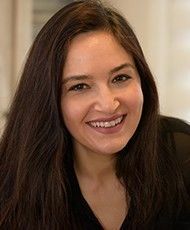 She is an avid blogger and author of the “The 10 Essentials Steps To Former Executive Immigrants Getting Their Dream Job.” Aline is an expert in helping small businesses recruit and hire the right people through a unique hiring process she has developed. Aline is fully bilingual in English and French and can deliver our programs in either official language. Julia is an accomplished Human Resources leader with over 20 years of expertise in a variety of organizations within the pharmaceutical, rail, oil and gas and pipeline industries. Julia has lead teams and supported clients across Canada in all facets of human resources including: employee relations, performance management, training, leadership development, compensation, organizational restructuring and business planning. This experience has allowed her to cultivate a deep understanding of how a people-focus can significantly impact business success. Her career experience has demonstrated that through the alignment of HR strategies with an organization’s goals, companies realize both a positive bottom-line impact and greater organizational productivity and morale. Julia is known for her ability to work closely with clients and develop a clear understanding of their business and personalities. Her strong business acumen and human resources background enable her to support clients in their goals to achieve success. Audrey has been delivering career coaching for 15 plus years to a client base that spans 30 countries covering a range of sectors and roles. As an award winning resume writer and employment interview expert she brings exceptional experience in helping people land new jobs and win promotions. Audrey is often called upon by national media outlets to comment on career matters and issues. Fred is our immediate past President where he served with distinction for over 15 years. 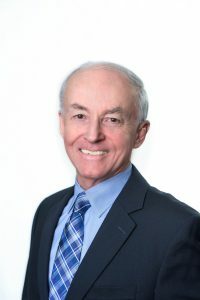 Prior to taking over D.C.Harrison & Associates Limited, Fred held senior positions in HR including Director of Human Resources for both McMaster University and St. Joseph’s Hospital. 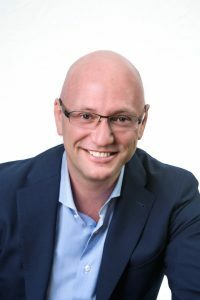 Recognized for his expertise in career transition, he has provided counselling services for clients across a range of positions, front line to executive management in both private and public sectors. 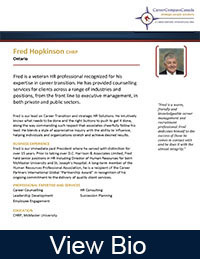 A long-term member of the Human Resources Professional Association, Fred is our lead on Career Transition and strategic HR Solutions. He is a recipient of the Career Partners International Global “Partnership Award” in recognition of his ongoing commitment to the delivery of quality client services. Fred serves as Executive Vice President. Lauri is an expert in branding and communications in all facets of Talent Management and HR. 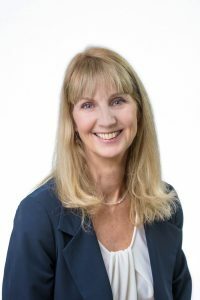 With over two decades of senior leadership experience, Lauri stewarded the Canadian divisions of two of the world’s largest recruitment communication agencies offering best practice strategies and program execution to attract and retain talent. She has worked in HR management roles in the insurance and hospitality sectors and provides clients today with strategy in leadership training, marketing and HR policy matters to drive a culture of engagement and innovation. Lauri has a French Language major from York University and provides services in both official languages. Emily is senior recruitment consultant and career transition specialist with a focus on strategic talent acquisition and business strategy. Brings a successful track record of translating operational business requirements in terms of strategy and prioritizing team efforts to create and execute viable strategic plans. A trusted leader, known for inspiring collaboration that aligns with project milestones and performance-based goals while adhering to guidelines and procedures. Highly qualified Bilingual (French/English) HR professional with a range of experience in multi-national organizations ; 10+ years of progressive roles and responsibilities within the HR industry. Emily is a leader in large assignment outplacement operations and has led recruiting initiatives for various companies, with a focus on long-term organizational effectiveness, cost savings and recruitment best practices. Emily has a Human Resources Management Certificate from Sheridan College. 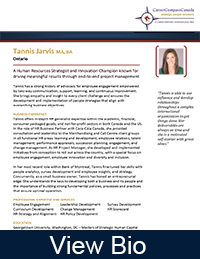 Tannis offers in-depth HR generalist expertise within the academic, financial, consumer packaged goods, and not-for-profit sectors in both Canada and the US. In the role of HR Business Partner with Coca-Cola Canada, she provided consultation and leadership to the Merchandising and Call Centre client groups in all functional HR areas: learning and development, employee relations, talent management, performance appraisals, succession planning, engagement, and change management. As HR Project Manager, she developed and implemented initiatives from conception to roll out across the country, with a special focus on employee engagement, employee innovation and diversity and inclusion. In her most recent role within Bank of Montreal, Tannis fine-tuned her skills with people analytics, survey development and employee insights, and strategy. Concurrently, as a small business owner, Tannis has honed an entrepreneurial edge: She understands the keys to developing both a business and its people and the importance of building strong fundamental policies, processes and practices that ensure optimal operation. Talyaa embraces a core philosophy of whole-person coaching. She probes and distills information on multiple levels, from mental, emotional and psychological through to political, cultural and professional. Each individual benefits from an outcome-frame orientation around their goals and challenges, developing new perspectives to create sustainable change. With extensive executive-level experience spanning more than 15 years in various industries in Europe, the Middle East and Canada, Talyaa understands the challenges at every level of management. Early in her career, she progressed from Management Trainee to General Manager level with Proctor & Gamble, honing indepth marketing, business management, corporate strategy, and leadership finesse. A founding partner of the FLOW Coaching & Leadership Institute, she provides a creative space for individuals and organizations to reach their loftiest goals. 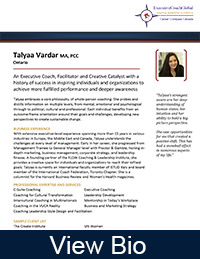 Talyaa is currently an international faculty member of ISTUD Italy and board member of the International Coach Federation, Toronto Chapter. She is a columnist for the Harvard Business Review and Women’s Health magazines. As CEO of Career Compass Canada, Al plays a critical and integral role in partnering with clients to realize impactful people solutions and resolve complex organizational issues. Al has been responsible for several high-profile transformational corporate assignments. He is skilled in creating positive relationships with business leaders, delivering strategic advice and collaborating to achieve specific articulated results. 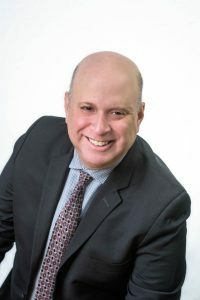 He sits on the Board of Directors for the Peel Chapter of the Human Resources Professional Association and is an active member of the HR committee for the Hamilton Chamber of Commerce. He chairs the HR Roundtable with the Burlington Chamber of Commerce and, every Tuesday at 7:00 pm, hosts the TV show Hamilton Works on Cable 14. Professionally accredited in Public Relations, he is also an active member of the Canadian Public Relations Society.